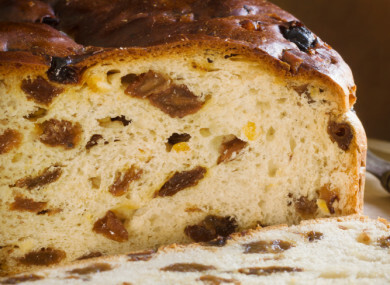 HALLOWEEN IS approaching, and with that comes lots of delicious treats, including the traditional fruit cake, or barmbrack as it’s more widely known in Ireland. The word originates from the Irish words barin and breac, which translate directly “speckled loaf”. This traditional autumnal cake was eaten on Halloween, and it had some surprises baked within it which were said to tell a person’s fortune. If you came across a pea in your slice of brack, this was thought to be a sign that you would not marry that year. A stick would signify an unhappy marriage, a coin would bring good fortune, and a ring would signify marriage. Nowadays, fruit cakes and barmbracks are available to buy from almost any grocery shop, but why not get the kids involved in making your own this year (and don’t forget to include the ring!) Read our top picks below. 1. Barmbrack, from I Love Cooking: This classic Irish barmbrack recipe is made in the traditional way by soaking dried fruit overnight in tea. Turn it into a showstopper by topping with fresh cherries and a dusting of icing sugar. 2. Cinnamon and Orange Fruit Cake, from Cake and Cookie Blog: A fragrant, moist and zesty orange based fruit cake. The hint of cinnamon goes a long way and adds a lovely autumnal kick! 3. Pineapple Fruit Cake, from Retro Mummy: Sweeten up the typical fruit cake with the addition of tinned pineapple, genius! Even the kids will love this tasty tea time treat that offers a lighter take on a traditional fruit cake. 4. Chocolate Cherry Fruitcake, from David Lebowitz: A chocolate flavoured fruit cake? We love the sound of this irresistible flavour combination that even the pickiest eaters won’t be able to say no to! 5. Vegan Fruit Cake, from Fiona Cairns: This dairy and egg free recipe is perfect for vegans, those with allergies to dairy products or indeed anyone wanting a speedy, delicious fruit cake. 6. Jamaican Fruit Cake, from Kitchen Nostalgia: This rich and comforting fruit cake is packed with flavours like cinnamon, vanilla and mixed spice. Delicious! Email “6 of the best... barmbracks and fruit cakes for a Halloween treat”. Feedback on “6 of the best... barmbracks and fruit cakes for a Halloween treat”.